I know, I know... it’s not even December yet and you’re already overwhelmed by holiday decorations and Christmas music everywhere you go. Ready or not, the season is just around the corner. My tree is up and decorated, my gifts are bought and wrapped, and my plane ticket is purchased to go home to Missouri to celebrate the holidays with my family. Because I’m so busy cooking at this time of year, I like to get a head start on everything else related to the holidays to make sure it all gets done. With Thanksgiving weekend barely in the rearview mirror, you may not be as far along on the road to the holidays as I am, so this week I’m here to make things easier for you by helping out with gift ideas. I’ve curated a list of some of my favorite things I’ve discovered throughout the year. I’m also shining a light on some of my friends who have created some really special gifts that you’ll want to give to your dearest friends and family. Jaime says, “I believe that your space is your haven, whether at work or home, it’s absolutely worth any amount of labor and love, even if you don’t own it. That’s why I bring nature into unexpected places by designing customized plants for Broadway dressing rooms, homes, offices, balconies, backyards, and special events. I visit the space to get a sense of the flow, light source, and of the clients aesthetic. I then dream about a design and shop for the perfect plants and vessels for each space. This can often include up cycling a personal item or family heirloom like a teapot or coffee mug into a pot for a plant! Each design is completely customized for the client and totally unique. My assistant and I then install the design at the space, including hanging ceiling and wall hooks, shelves, or whatever else we may need. What a combination of books and chocolate! I have some favorites in both categories. Two friends have written books with some sweet deals they are offering alongside their tomes. First up is Erin Stutland; a friend, teacher, fitness leader, mom, wife, television host, and now a bestselling author (and the book hasn’t even hit the shelves yet!) I’m so proud of my friend and I’m excited to get my hands on my own copy of her book Mantras In Motion. PRE-ORDER NOW AND GET IMMEDIATE ACCESS TO THE AUDIOBOOK ($16 Value), A Guided Meditation Session ($19 Value) & MAGICAL MANIFESTERS WORKSHOP ($149 Value). This powerful online video workshop with Erin, along with an inspiring guided meditation are completely FREE when you pre-order Mantras In Motion. You get lifetime access to this transformational content! Get the Audio Book of Mantras in Motion for immediate download for FREE, and start listening (and changing your life) today! And if you just want the book, you can order it here! For the younger reader in your life, one of my friends from college (and one of my musical theatre idols,) Cate Berry, is now a celebrated children’s book author! She’s written Penguin and Tiny Shrimp Don’t Do Bedtime and Charles Santoso is the illustrator. Cate is offering a free copy to one of my All Good Things readers! Enter this generous giveaway by leaving a comment on the blog or on social media by midnight Dec 2, 2018 and a random winner will be drawn. We’ll tweet/Facebook/Instagram the winner that week so you can receive your book in time for the holiday. You can also purchase the book by going to this link! You didn’t think I forgot about the chocolate, did you? Nama Champagne Chocolate is some of the fanciest, smoothest, and most luxurious chocolate I’ve ever tasted. It is a must for anyone you love who loves chocolate. And it comes with a little shovel! A chocolate shovel. What?! Yes. Their site offers all sorts of other fancy chocolates but these are the ultimate. And they are reasonably priced for something so decadent. While we’re on the subject of reasonably priced decadence… Sojo Spa has become my home away from home. If you live in the New York/New Jersey area it’s an easy trip. If you are planning a trip a NYC, I swear this place is worth adding on a day to your Big Apple stay. It is an oasis of all things water and relaxation. It is a Korean Spa with every amenity you could ever want. Rooms of salt, charcoal, clay, ice, wet heat, dry heat… Pools of every temperature and skin/body benefit you could imagine. All year I’ve given day passes to some of my best friends or taken them for their Birthdays. It’s a perfect thing to experience alone and a perfect thing to share with someone you care about. Check out all of their current promotions for the holiday. Earlier this year I was given a jade roller. I put it in the fridge and I would wake up in the morning and while my coffee was brewing, I rolled that sweet little cold stone all over my face and under my eyes. It made me feel a LOT better about mornings. Google Jade Rollers and so many beautiful options come up. Buy within your budget, it’s worth it! Recently, I went to a yoga/spa Birthday party and there was an angel there giving Gua Sha facial treatments. Samantha Story is that angel and she works her skincare magic in NYC and Brooklyn. These treatments know no gender, they’re heaven for the face of a man or a woman! 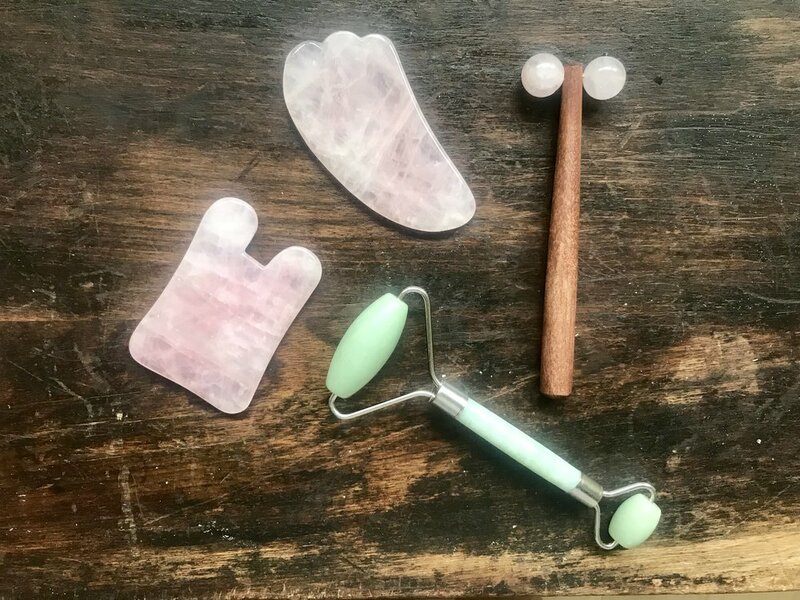 In the meantime, these tools give me so much calm, joy, and healthier skin - I just had to share them. If you have an Asian market near you, go there to get started! The stones will be cheaper. You can find a zillion versions on Amazon, but Samantha suggested Herbivore Botanicals, and they have really superior products. They also carry Jade Rollers! (If you’re in NYC, ABC Carpet And Home carries this brand.) You can watch online tutorials on how to use them and follow Samantha on instagram to gather all of her knowledge. Here is my medicine cabinet and my sleepy eyes at one in the morning as I am writing the blog. I use the AVON Anew lineup and they are all on sale! And while I’m sharing gender neutral skincare ideas - did you know that my Avon Lady is a MAN?! My dear friend and Avon Man, Chad Gilkison, has really whipped my skin into shape this year. (I’ll be honest, I am blessed to come from really beautiful Adams and Romero women with really good skin.) But friends, none of us are getting any younger. In fact, today is the youngest we will be for the rest of our lives! What are you doing to take care of your precious skin? Before I do all of my Gua Sha Woo-Woo stuff, I go to the basics - Avon. Yes, we all grew up with it, but have you been to their site lately? Competitive, modern, accessible, AFFORDABLE. Chad has a ton of holiday specials going. Here is a link to his Avon store. Lastly, instead of a recipe this week, I am sharing a resource that I use every single day. I recreate many of the New York Times recipes for my clients each week. The NYT Cooking subscription is truly my favorite email of the day. Not only is each newsletter full of recipes, but smart recommendations of books, television, movies, and articles (having nothing to do with food!) that the editors suggest too. I am inspired by something from NYTCooking Every. Single. Day. Of all the beautiful items and services I’ve listed in this post, this one might be the one you buy for yourself AND the cook in your life. Get your NYTCooking gift subscription here! Wishing you all good things this holiday season and stress free days and well rested nights! And don’t forget to leave a comment below to enter into the Penguin And Tiny Shrimp Don’t Do Bedtime giveaway!